Visit the Des Hommes et des Chatons Tumblr for more information. 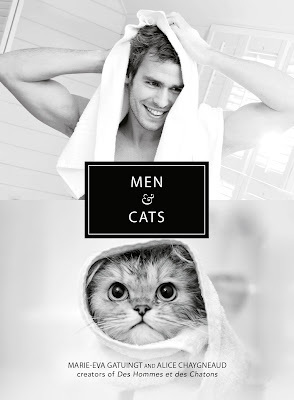 If you've ever seen the Des Hommes et des Chatons Tumblr page you'll know exactly what to expect from Men & Cats. It's an entire book full of pictures of hot guys and cute kitties, which in my opinion is pretty much the perfect combination! There are some absolutely gorgeous photos in here and I love the way they are paired up so you have a guy and a cat in a very similar pose. My only slight complaint was that some pages have a lot of white space around the pictures, I'd have liked the images to be a little larger to reduce that but it really is a minor thing and not enough to cause reduce my rating. Men & Cats is a hilarious coffee table book, my friend and I giggled the whole way through it but there may also have been a small amount of drooling too. With pics like these who could resist?